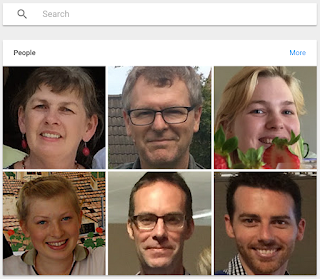 Google has done such a great job with Google photos that it puts Apple's equivalent to shame. Apple has had face identification for some time but the genius here is that it doesn't wait for you to name people, it just groups by face. Now, for some reason this feature is disabled for Australian users by default. To enable it I followed the instructions here and used an Android device as they suggest. I used TunnelBear for the VPN and all went as described. I'm currently in the process of copying 22,000 photos from my iPhoto and Aperture libraries up using Google Photos Uploader app for MacOS. Unfortunately, although I have 100Mbps download speed my upload speed is just 2Mbps and so the upload will take several days. It would have taken much longer as the Mac goes to sleep when idle. To stop it sleeping during the mega-upload I'm running Caffeine which is free from the app store. WWDC is next week but I doubt this is on the agenda. Interesting times.